We work with architects, interior designers and contract furniture specifiers on the design and development of bespoke upholstery pieces for their projects. Projects of note include the Cowley Manor Hotel 2008, The Barbican Centre re-fit 2006, English Heritage cottages 2005 and The Royal Aberdeen Children’s Hospital 2004. If you are interested in Coakley&Cox Ltd producing a bespoke piece for you, please contact Tim Cox using the details on our Contact page, or fill out an Enquiry Form. 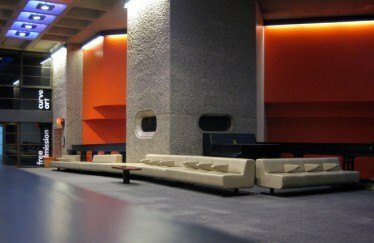 The Barbican Centre re-fit 2006. Featuring the SCP Slow Sofa system by Terence Woodgate, which was specially designed and adapted for this project.